I made a minion. Actually two. These are the characters from Dreamwork's Despicable Me franchise. My niece loves them, so I tried my hand at making them. Actually I started off by getting my yarn. I used five colors: brown (for the eye iris - you only need a little and you can use whatever eye color you'd like), light grey (eye), black (goggles, gloves, shoes, hair), sparkly blue (overalls), and yellow (skin). Actually the grey should be white, but I didn't have white so I used light grey. I'll call it white in my pattern because that's the optimal color but light grey looks fine. Other things you'll need - crochet hook (obviously), yarn needle, stuffing. It's possible that you could use Safe Eyes or something instead of the brown yarn for the pupil but I just had yarn on hand so I just used yarn. This part follows the video pretty closely. Make a magic circle with 6st like at the start of the video. 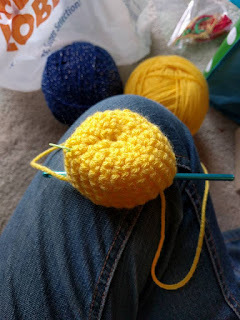 Put two single crochet (SC) in each stitch. It's helpful to mark where your circle starts (thanks to my awesome coworker Kathy, I have stitch markers!). Do the whole round. Put one SC in the first stitch, then two SC in the next - repeat for the whole round. Put one SC in the first stitch, one SC in the second stitch, then two SC in the third stitch - repeat for the whole round. This time, put one SC in each stitch for the whole round. This should make a nice curve because we are moving from the dome to the straight sides of the Minion. Continue putting one SC in each stitch and make the head as long as you would like. When ready, no need to cut or tie off yet - just leave the active yarn hanging. Next, snip some black yarn a few inches long and tie them on top near the center of the head to make some hair. I found it easier to use longer threads then trim them if desired. I used a yarn needle to loop the thread around a stitch, then knotted it, then use the needle to loop one side around again then pulled so the knot was on the inside. Next, I made the goggles. Make a magic circle like above (don't pull the center extremely tight - you will need to make a pupil) and leave a tail so you can connect to the black. Tie to the white (I made a slipknot on one, then knotted the other onto it, then pulled tight) and do one round of two SC in each (you don't want it to curve - you want a flat eye). If you're just doing one eye, then you're ready for the strap. 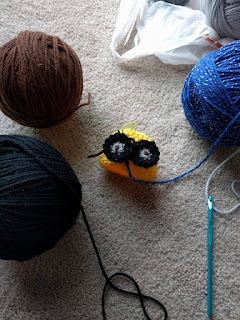 If you're doing two eyes, then repeat the White yarn step above but tie it off at the end and then move into the black yarn step (or join the colors however you want) and do the step finishing at the nose of the glasses. Really you can make this any color - I used brown for the contrast against the white/grey of the eye. I cut a few inches of yarn, then tied the yarn to one side of the back of the pupil. I then loosely pulled it across the center of the eye and tied it over on that side, leaving plenty of give in the center (you'll see why). I then went to the front of the eye and used the hook to pull the brown yarn through. Play with it to make it pop through however much you'd like. Trim any ends if needed. With one eye, you don't need to tie off - just move right into the strap. With two eyes, you finish at the 'nose' of the goggles so you'll need to tie off and then stitch in as the 'ear' of the goggles. Once you place your goggles where you want them on the face, start slip stitching all the way around the head until you join with the other side. I then slip stitch around the goggles to attach them to the face just for extra security (and so they wouldn't peel up or down), or you can use the yarn needle and tack down the edges of the goggles. I snipped a length of white and used a yarn needle to make a smile. 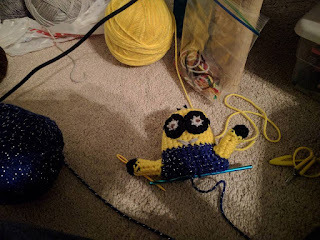 I connected the blue to the yellow on the back of the Minion, so finish your yellow to the back and then join the blue (slip knot one, knot the other into the slip knot, pull tight, or use whatever joining you prefer). SC into each stitch at you want to continue the straight sides of the Minion. Go for however many rounds you'd like - closing off the bottom does not add much length so make the torso however long you'd like. 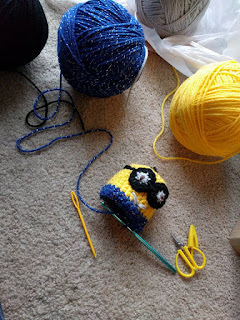 Once you're at your desired length, leave the blue yarn hanging (don't cut off). 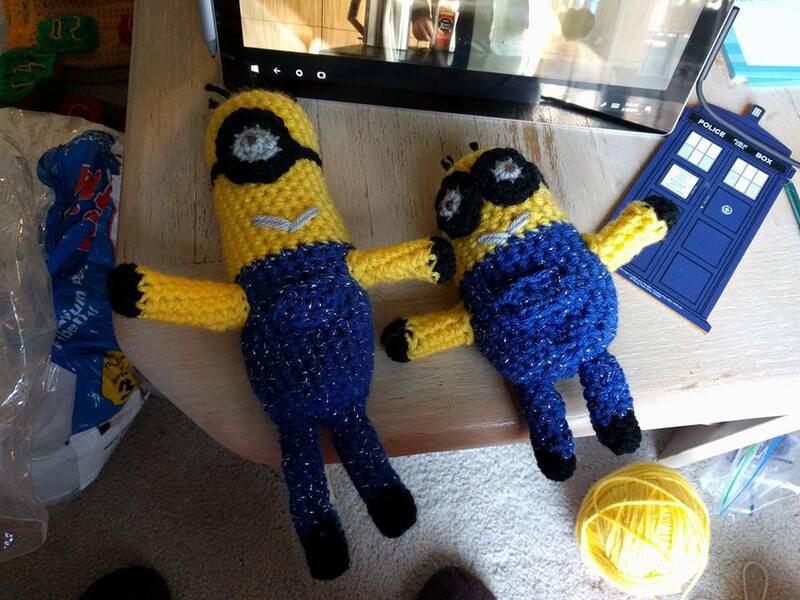 I made and attached the arms at this point so I still had access to the inside of the Minion. Make a magic circle with 6st like earlier, but only put one SC in each (makes it turn down right away). Join the yellow to the black and continue doing SC rounds until the arm is the desired length (8 rounds worked for me). I then attached the arm by slip stitching into the torso all the way around the arm base. You could probably just stitch it on if that's easier. Be careful where you attach the arm - don't put it too far back on the sides or the arms will point backwards rather than forwards. **NOTE** I did not stuff the arms (or legs). They are quite thin and I wanted them to be maximally flexible. You could stuff them if you want a more rigid shape. Then the fun part - make another glove/arm combo that's the same size as the first one and attach it to the other side. As previously noted, I did not stuff the limbs but I did stuff the body! I used yarn scraps for one Minion and actually stuffing for the other - use whatever you want to stuff it. It's a fairly open shape, so no need to poke it into crevices or anything like that. Mark the start so you know when a round is done. Put one SC in the first stitch, one SC in the second stitch, then skip the third stitch - repeat for the whole round. Put one SC in the first stitch, then skip the next - repeat this round and round until the loop is closed - I finished with a slip stitch and then knotted and wove in the end. Repeat the black gloves steps. Repeat the yellow arms steps. Attach the legs to the body in a similar fashion, but this time you won't have access to the inside of the Minion since this attaches to the closing. More fun times - make another shoe/leg the same size and attach it. You can make a pocket on the front of the overalls - it will be tiny and slightly frustrating. I stitched in, then chained about three, then stitched in to make the top of the pocket, then went down and repeated but joined with the previous row, and then the final row was joined to the torso and the previous row. I might try just stitching a pocket separately then adding it on - would probably be easier. Weave in any ends and your Minion should be good to go!